I got to take some trips involving the Boeing 737. The first one was a sales trip to Central and South America. 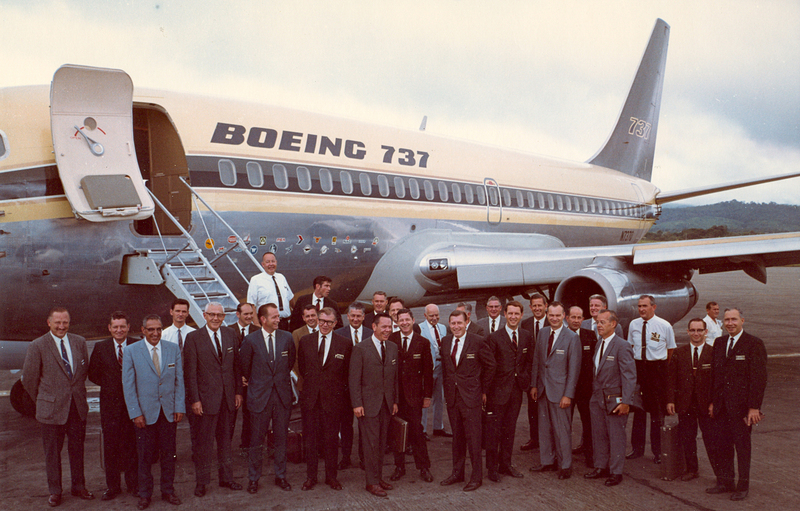 I was one of several Boeing pilots who performed demonstration flights with prospective customer pilots. The countries visited were Brazil, Chile, Argentina, Panama, Costa Rica, El Salvador, Mexico & Honduras. We departed from Miami and the first stop was Natals. This stop was for fuel. No demonstrations were made. The next stop was Rio de Janeiro. We stayed a couple of days making demonstration flights. Rio was pretty, but was full of prostitutes. I guess the beach was a mess, full of drug addicts. The next stop was Sao Palo. We made several demo flights. One thing I remember about Sao Palo was one square block in the middle of town devoted to cats. Apparently anyone tired of their kitty cat could bring it to the downtown and dump it. There were lots of cats and it really did small. I never realized kitty poop smelled so bad. The people in Brazil speak Portuguese. About 1645 the Spanish and Portuguese got together and decided that the eastern part of the new world belonged to Portugal and the rest of South America belonged to Spain. Portugal and Spain were world powers at that time. 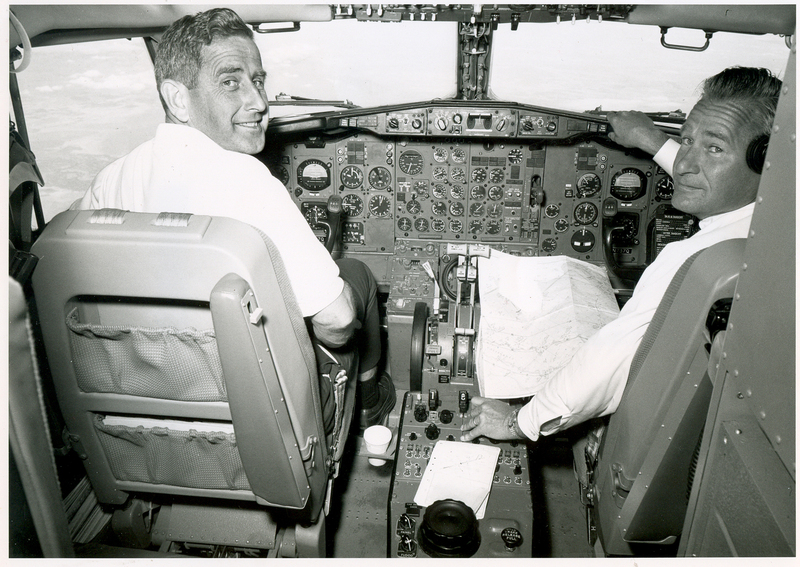 Above, Ray McPherson and Jim Goodell over the Andes mountains in the 737. The next stop on the 737 sales trip was Buenos Aires, Argentina. We were to land at an outlying airport. The runway was about 7000 feet long which is ok for a 737, but the airport only had an ADF approach and the weather was bad. I got to make the ADF approach and I did it wrong. It was a long approach and the weather was down the minimums for the approach. I should have descended sooner. As it was, I broke out of the overcast at 400 ft right over the airport and not in position to land. The weather at the big airport was below minimum. The nearest suitable alternative airport was 200 miles west. Going there was possible, but not desirable. I elected to do another ADF approach and did it right. I got down sooner and after dodging TV antennas, landed ok.
Another concern was the runway length. We had thrust reversers but they didn’t work. We had been advised about this at the beginning of the trip, but were told to use them to create thrust reverser noise, but not to expect any stopping air from them. I landed ok and got stopped with no problem. Successful thrust reversers’ came later during the 737 program. I became acquainted with Pisco Sours, a popular local drink. Several demo flights were made with no problems. In talking to some of the locals from the US, they made a lot of money in Chile, but the cost of living was high. Automobile for example cost 4 or 5 times more than a car in the US. The next stop was Panama. I had been to Panama before in 1943 when I was in the Navy. I told my companions about the good floor show they had in Panama, so I talked them in attending a nightclub to see the nightlife. When I had been in Panama with the Navy, it was on the Atlantic side. We were now on the Pacific side. I don’t know if that was the difference, or if all of the good looking females left town after the war, but the floor show was terrible. One woman needed a tent for a dress. My companions really needled me about my selection of entertainment. We had a demonstration flight to do in Panama. It was to be at an airport north of Colon. Unfortunately I was the pilot. The runway was about 6 or 7 thousand feet long which was no problem, but my landing was. There was a thunderstorm in the vicinity. It was a few miles west of the airport. I elected to fly east and land to the west toward the thunderstorm. I don’t know if that caused my bad landing, but it was a cruncher. I didn’t break anything on the airplane, but we hit hard. The sales rep apologized for me by saying I was just trying to demonstrate a short landing. It was short alright. We had to taxi a long way to get to the terminal. My fellow pilots said I should have landed in the other direction. In truth I don’t know why I fell out of the sky so bad. After Panama came Costa Rica, a beautiful country. In fact, a lot of U.S. citizens retire there. The problem we had getting there was rain, lots of rain. We made one trio up there, but had to go back to Panama. The rains came in the afternoon and if you didn’t get there before the rain, you couldn’t land. There was no suitable instrument approach. The next day we got an earlier start and landed ok. I don’t know if we flew any demos there, but surprisingly go in a golf game. The course was good but the greens were strange. They were Bermuda grass (I think). Anyway, when you putted against the grain you had to hit the ball twice as hard. It took a few holes to catch on to this. The next stop was Honduras. Tegucigalpa was the town. The airport runway was short, downhill, and ended with a cliff at the end, with the town at the bottom of the cliff. I think the runway was only 6000 ft long. I didn’t fly any demos there and I am glad. We didn’t stay over night. When we called for our clearance to tower, they wanted to know we had some gifts for them. We did and handed them out and got our clearance. Our next stop was Mexico City. We flew several demo flights there. Mexico City is 7000 ft above sea level. So the 737 really has to get going to get off the ground. I was amazed how the nose wheel hummed before we got off of the ground. It is a little wheel so has to turn a high R ply. After our demo flight we flew the group of customers down to Acapulco. Our leaders told the pilots to get lost while they took the dignitaries to lunch. We went to lunch and then visited the cliff where the divers dive into the sea. It’s a long dive. Looks to be at least a hundred feet. We flew back to Mexico City and I had the next day off so I took a tour. On the tour I saw the pyramid where Montezuma sacrificed people, the square where a Mariachi band played, and a church that people crawled into on their hands and knees. They must have crawled a fourth of a mile. I guess they hope to get cured inside. The tour ended after we left Mexico City. We flew to El Paso, cleared customs and flew to Seattle.